Boronia megastigma lutea – The Yellow Boronia. 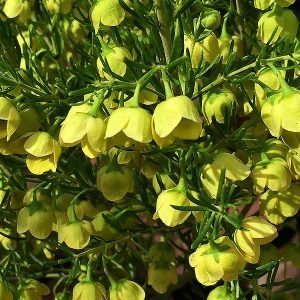 If you wanted a plant for fragrance in spring, then Boronia megastigma lutea is it. From the south of Western Australia, Boronia megastigma offers the gardener a number of very attractive shrubs. The species itself with brown flowers, however both red and yellow forms are also available. Boronia megastigma lutea is the yellow flowering form, and the flowers are a brilliant yellow in spring. This is a plant that can be grown in the garden or in a container. The flowers are small and bell shaped, very fragrant and will cover the plant for weeks. The foliage a good deep green. This is a plant that benefits from regular light pruning, best immediately after flowering. Always prune during cool weather when the plant has been watered.